In case you missed it earlier this year, Momcilovic's case on the reverse-onus provisions in Victoria's Drugs, Poisons and Controlled Substances Act and the Charter of Human Rights and Responsiblities Act didn't provide all the answers we had hoped it might. 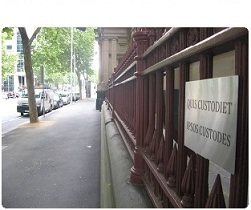 The Lamp Post blog recorded that the High Court granted Momcilovic and her lawyers special leave to appeal. No word of the date yet, but it's already been picked up in the mainstream media and is sure to generate a lot of interest as well as potentially set the stage for Charter interpretation and application in Victoria for a while to come. If SC wants to delay his/her trial, then his/her lawyers (Edney & Robert Start) should raise the High Court's judgment in Dickson v R, to argue that s 5 of the DPSCA in conjunction with ss 71AA, 72 & 73 is inoperative due to inconsistency with s. 13.1(1) of the Cth Criminal Code in conjunction with ss 302.2, 303.4 & 308.1 of the CC. If the argument succeeds, then that'll get rid of the possession reverse onus, although the CCC still has reverse onuses on intent to traffic.